I used to dislike blue cheese. Besides being gross, I thought it was simply illogical. Mold?! In food?! Just doesn't make sense. Admittedly, up until that point, I had never actually tasted a good blue cheese so my preconceived notions were based on the stuff that's pre-crumbled, packed in plastic containers, and on sale because it's about to expire. When I was in college, my wonderful friend, Christof, took me to a cheese tasting at Central Market with some university food group (I think?) he was in. Clearly I don't really remember who organized the event, but I do remember tasting gruyere for the first time, and I also remember realizing that I LOVED blue cheese as well. 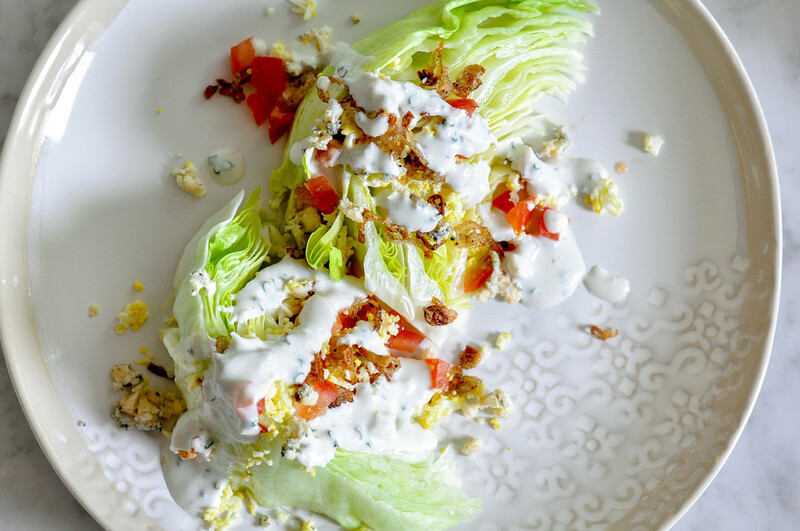 One of my favorite uses for blue cheese is on a wedge salad. I know iceberg gets a lot of hate and I'm not sure why. I mean, I wouldn't use it on a Caesar salad, but who would? 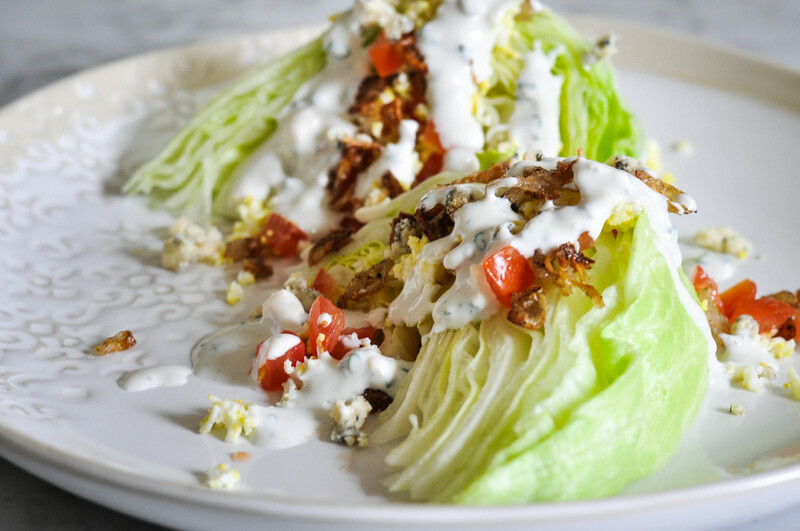 I do however think that a good wedge salad with crispy, refreshing, juicy iceberg just can't be beat. 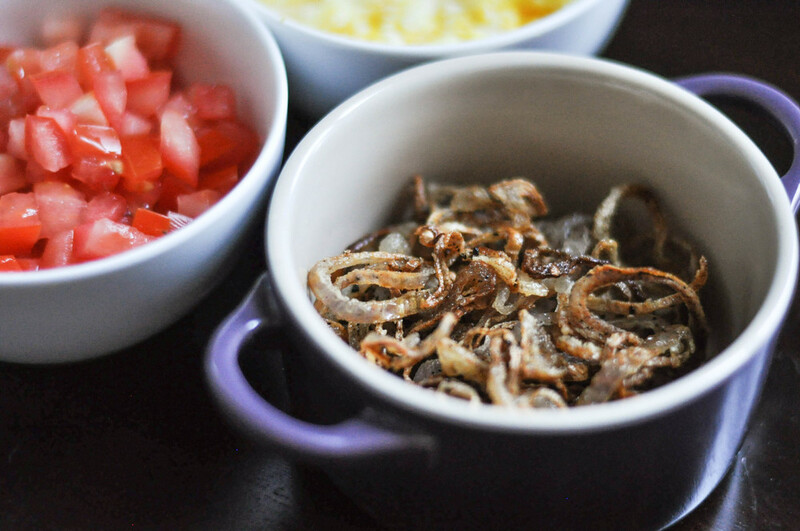 Most wedge salads come topped with bacon, this recipe will omit bacon and instead use some fried shallots to mimic the crispiness. I generally eat a largely pescetarian diet, trying to eat non-fish meat maybe once a week, so I'm always on the lookout for good vegetarian alternatives. Instead of cutting a head of iceberg into quarters, I like to cut my lettuce in eighths since it gives more surface area on which to scatter the delicious toppings. Serves 4 with dressing leftover. In a bowl or liquid measuring cup, whisk together sour cream, buttermilk, vinegar, garlic, salt and pepper until smooth and homogenous. Fold in blue cheese and chives. If the dressing is too thick, add more buttermilk, a little at a time, until you reach your desired consistency. Refrigerate until ready to use. Sprinkle the shallots with some salt and dredge in flour. In a small skillet (or saucepan if you want to use even less oil), heat 1/4 inch of oil on medium high. Once oil is shimmering and it crackles when you flick in a tiny amount of water, drop shallots in and fry 3 to 4 minutes or until golden. Immediately drain and set aside until ready to use. Cut iceberg into eighths. Place two wedges on each plate. Top with tomatoes, egg mimosa, fried shallots and some crumbled blue cheese. Drizzle some blue cheese dressing on top, add a few grinds of salt, and serve.